Kristen DeLaune, center, laughed with friends during Father Eddie Voltz's Theology on Tap talk at Kirkwood Station Brewing. Theology on Tap is held monthly, giving young adults a chance to meet, socialize and learn about topics relevant to young adult Catholics. The Annual Catholic Appeal provides hope and joy throughout the archdiocese by funding dozens of important ministries. It includes Catholic education, programs helping homeless people and others in need, support for marriage, Newman centers on college campuses, efforts to respect life, criminal justice work and much more. “Tell Your Story” is the theme of this year’s appeal — highlighting how every story of life and faith contributes to who we are as a Church and reveals Christ Himself to the world. Kristen DeLaune and Olivia Jakubicek greeted friends as they arrived at Theology on Tap at the Kirkwood Station Brewing Company in Kirkwood. They sat at a long, solid-wood table and sipped craft beer. After the waitress brought their meals — cheese quesadilla with chips and salsa for Olivia and a loaded burger and fries for Kristen — they made a sign of the cross and prayed for God’s blessing upon themselves and their meal. Kristen, a nursing student at Saint Louis University dressed in scrubs, talked about a recent retreat. The conversation turned to Lent. Olivia said she hoped to frequent the sacraments more and give up coffee. Kristen said she wanted to add a new dimension to her prayer life — meditating on the Passion more dynamically. The Young Adult Ministry programs allow her to delve into a conversation about an important spiritual topic. “It’s just a comfortable feel for someone who loves being Catholic and loves growing in their faith,” Kristen said. Funding from the Annual Catholic Appeal allows the ministry to sponsor events such as the social-and-faith-building Theology on Tap as well as small group gatherings, pilgrimages, service work and more. Theology on Tap fills a void for Olivia, a native of Cary, Ill., and occupational therapy student at St. Louis University. “I didn’t grow up in an area with a large Catholic community and I was blown away the first time I came by all the awesome young adults here,” she said. 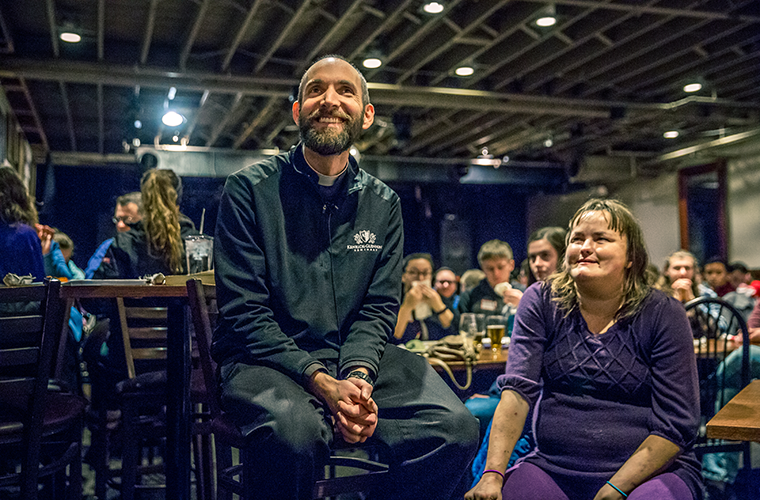 Father Eddie Voltz spoke to young adults about “The Origin of Joy” at a Theology on Tap session at Kirkwood Station Brewing. Theology on Tap is sponsored by the archdiocesan Young Adult Ministry, which is supported by the Annual Catholic Appeal. Matt’s been coming to programs of the Young Adult Ministry for a few years now. The Florissant native and current member of St. Joan of Arc Parish in south St. Louis noted the difficulty post-college grads have in connecting with the Church, adding that parishes are starting to provide more offerings for young adults. A structural engineer who attended an engineering program at the University of Missouri-St. Louis/Washington University and grad school at MIT in Boston, he enjoys the ministry’s Discipulus Institute classes for enhancing his understanding of Church teaching. Jon, a public affairs officer for the U.S. Air Force and member of the Cathedral Basilica of St. Louis Parish, moved here from Charlotte, Va. He and Matt are leaders of an Emmaus group for men pursuing a better faith life — “going forward as a team toward the mark of the high calling of Christ,” as he described it. Theology on Tap is held the second Tuesday of each month at 7 p.m. at Kirkwood Station Brewing Company, 105 E. Jefferson Ave. in Kirkwood. It’s packed with participants who hang out and listen to a talk relevant to young adults. In February, Auxiliary Bishop Mark Rivituso talked about Lenten resolutions, asking the young adults to focus on deepening their encounter with the Lord and becoming more like Jesus. Lenten resolutions, he said, lead to a deeper celebration of the joy of Easter. Nick Lee, director of the archdiocese’s Young Adult Ministry, said parishes have a history of reaching out to young adults — his parents met at one at Sts. Peter and Paul Parish in the Soulard neighborhood of south St. Louis — and the archdiocese began a centralized office for the outreach in 2011 tailored to people approximately ages 21-35. The Annual Catholic Appeal has been a boost for its efforts and the work of the Catholic Youth Apostolate, which oversees it. Two full-time staff members collaborate with parishes, develop young adult leaders, support young adult groups within the archdiocese and organize events. It’s grown from 25 people at the first event to events now — Theology on Tap with 350 people and the Encounter conference with 550 people. They now have a list with 2,000 young adults who receive a weekly emails about ministry events and happenings in the parishes and archdiocese. Young adults are at a stage where they make their most important life decisions, Nick said, including marriage, a call to a vocation, careers and more. “The Church needs to be in the lives of young adults during this stage. It is a crossroads,” he said. 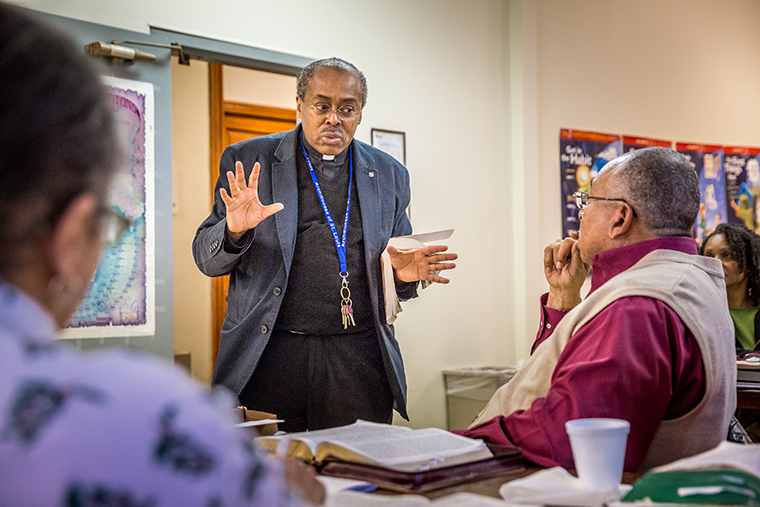 Father Art Cavitt, executive director of the St. Charles Lwanga Center, hosted a Bible study session at the center. The center, which is supported by the Annual Catholic Appeal, promotes Catholic teaching, spiritual formation and leadership development, including advocacy for justice and racial equity concerns within the black Catholic community and for all who collaborate with them. On a weekday afternoon, more than a dozen people gathered at the St. Charles Lwanga Center in north St. Louis to discuss the Book of Tobit and how it applies to the present. They discussed how Anna, wife of Tobit, didn’t want her son to leave when he is sent on a journey by his father. Several others cited their strengths, doubts, the need for patience and holding onto faith. They explored the concept of evil, the despair that some young people feel and more. Father Art Cavitt, director of the Lwanga Center and pastor of St. Nicholas Parish in St. Louis, explained how the Bible stories show God is with people on their journey, how to still have faith when facing uncertainty and how prayer is important. The mission of the St. Charles Lwanga Center, which receives funding from the Annual Catholic Appeal and is sponsored by nine parishes, is to promote Catholic teaching, Catholic spiritual formation and leadership development, including advocacy for justice and racial equity concerns within the black Catholic community and for all who collaborate with them. The most recent session of the Bible study began in September and continued for 18 Wednesdays. There is no fee for classes, but free-will offerings to the center are welcome. Brunetta Douglas of St. Elizabeth Mother of John the Baptist Parish in north St. Louis has a simple explanation for why she enjoys the Bible study. “It’s a good feeling,” Douglas said. James Cooper of St. Monica Parish in Creve Coeur pointed to the Bible he brought to class. It’s the first Bible he’s owned. The class enhances Cooper’s understanding of Scripture because participants discuss it and Father Cavitt clarifies points as needed. 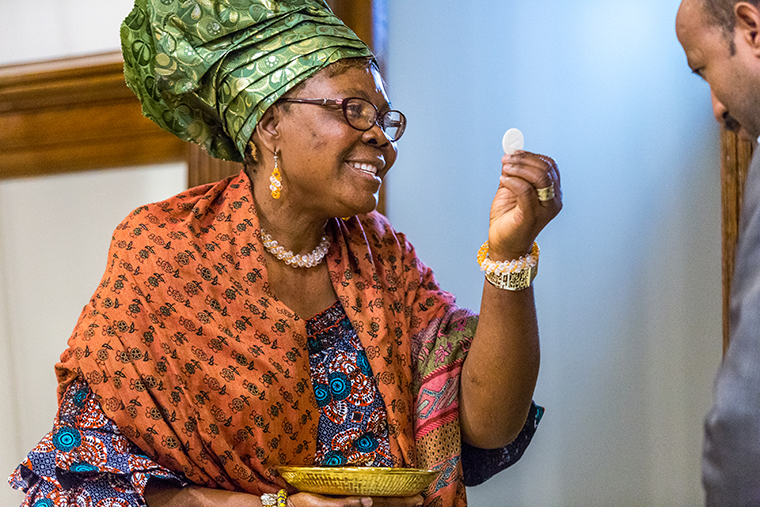 Happy Aboflan, a parishioner at St. Pius V and immigrant from Togo, distributed the Eucharist at the Migration Mass, held each January at St. Pius V. For the past 10 years, Aboflan has assisted, welcomed and advocated for immigrants as a volunteer with the Immigrant and Refugee Ministry at the parish, which is supported by the Annual Catholic Appeal. Happy Aboflan, a native of Togo, was helped by St. Pius V Parish in south St. Louis and for the past 10 years has volunteered with the Immigrant and Refugee Ministry at the parish. The ministry welcomes, assists and advocates for refugees and immigrants who are settling in the neighborhoods around the parish and elsewhere. It receives funding from the Annual Catholic Appeal. Aboflan speaks English and French, which helps communicate with the refugees and immigrants. Without the parish’s help, she said, she wouldn’t be in such a good place in her life now. A greeter and extraordinary minister of the Eucharist at the parish, Aboflan also volunteers at the Society of St. Vincent de Paul food pantry at St. Pius, which serves people in need throughout the parish. The financial goal of the 2018 Annual Catholic Appeal is $14.2 million. Approximately 91 cents of every dollar raised goes back into the community in the form of direct services. To learn more about the appeal or to make a donation, visit www.archstl.org/aca or call 314.792.7680. • Emmaus groups are small faith-sharing communities with leaders trained to lead Bible studies. About 25 of these groups operate within the archdiocese. • Monthly service opportunities are available at Peter and Paul Community Services homeless shelter and at Our Lady’s Inn, which provides housing, job training, health care and more to pregnant women who are struggling with homelessness. Every August they assist at an elegant dinner for poor and homeless people that is served to commemorate the Feast of St. Louis IX. • Other activities include retreats, in-depth courses on faith and recreational sports. A transition of the ministry involves efforts to help parishes plan young adult initiatives.